A weekend retreat designed specifically for Families with kids 8 years old and older (even families with college age ‘kids’) who are looking to grow closer together via exciting outdoor adventures while also growing in their relationship with our loving savior Jesus Christ. 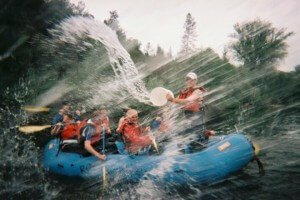 We combine together two days of Class III Whitewater River Rafting Trips on two exciting sections the South Fork American River in California to help set the stage for a weekend of growthing and bonding through shared experiences that will last a lifetime. With excellent Christian guides, great food and 20 miles of beautiful river, it’s the perfect family retreat. This retreat is optimized for active families excited to spend a weekend together screaming for joy and fear as they rush full speed down a raging river into the white water rapids below. All participants should be at least 8 years old. We don't yet have this guest locked in. We'll update you once we finalize the details. If you have any questions, want more details, or just want to talk to a real live human being, please call or contact us, we’d love to talk.